gorgeously gooey, creamy, and stuffed with fresh veggies, this is (i think) pretty much the perfect grilled cheese. 1. take half (2 tablespoons) of the ricotta and spread it on one slice of bread. repeat with second bread slice and remaining ricotta. 2. sprinkle or crack black pepper directly onto ricotta, to taste. 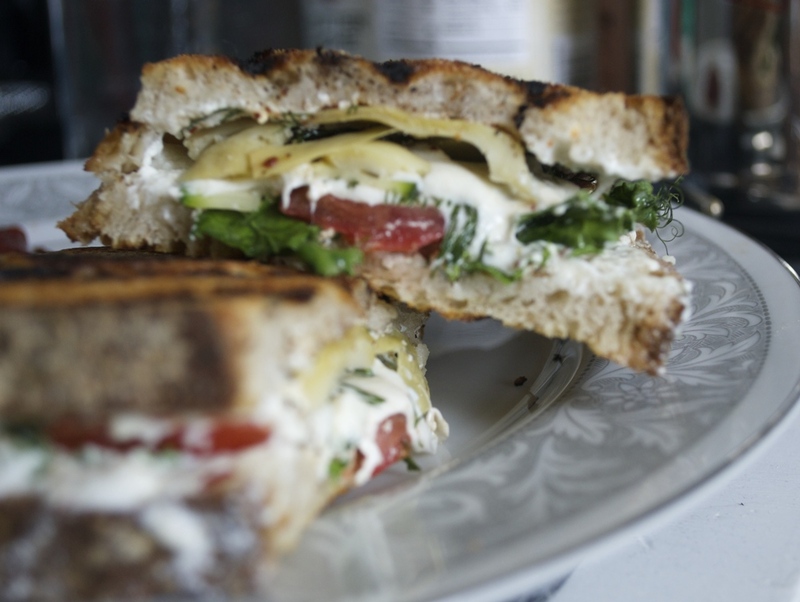 3. pile remaining sandwich ingredients (tomato, greens, mozzarella, artichoke hearts, and dill) onto one slice of bread. top with the second slice. 4. heat a skillet over medium-low heat. add butter and olive oil to the pan. Once the butter has melted, place sandwich in the hot pan and press down with a lid. cook until bread turns a deep golden brown (about 5-6 minutes), then remove the lid, flip the sandwich over, and place lid back on top. Cook until second side is also golden brown and all the cheese has melted.